Thanks to her father’s side, Jhynn’s complexion is light for a Garundi, but she keeps her hair in the tight dreadlocks commonly seen from Garundi humans. She wears practical clothing for travel: breeches, high boots, a cloak and shirt. Her rapier hangs off one side of her belt, and vials of potions and alchemical extracts are readily accessible on her right hip. She wears a black deerstalker cap featuring a subtle, sinister, eye-like design stitched on the front flap. Her pointed ears sport several piercings. Jhynn is a materialist and a realist. She prides herself on seeing things as they are, not as she wishes them to be. In a world with seemingly unlimited magical power she sees little special about ‘deities’ and has little respect for those who slavishly bow to them. She doesn’t really believe in good or evil as abstract notions, and thinks all beings are capable of good or evil actions. Consequently she believes that law is the only thing constraining the worst impulses of man. She is a relativist, so without any universal moral principles to measure their actions against, all we can do is judge people against their own rules and standards. The laws that fit one nation and one people may be wholly inappropriate in another place. With the incredible diversity of the world there are plenty of options. She no longer wishes to live in an undead kingdom like Geb, but doesn’t begrudge them for living according to their own code. The even application of the law, whatever code of laws a nation happens to have, is the only way to ensure peace, prosperity and equality. She’s not unattractive, but her cold, blunt demeanor has not been popular with the fellas. Men often find her exceptional intelligence intimidating as well. In general people find her bitter realism to be off putting. She doesn’t sugarcoat her often blunt appraisals of the facts as she sees them. Yet, she is cautious in her speech, not willing to make declarative statements until she has firm proof, but will not back down once she is convinced of something. She feels the same way with others, she needs to see proof of their character through their actions, not through any smooth words. While she is not moved by emotion the way others are, she is still extremely perceptive at reading people. She has an acute sense of what people are thinking and feeling, and uses that to her advantage in any social encounter. She likes to plan things out and be prepared for anything. Jhynn was born in 4660 AR in the Geb metropolis of Yled. Her father was an elf from Avistan, who came to Geb as part of the Voices of the Spire to destroy and undermine the undead kingdom. There he met her mother, who worked within the Wagons of Light to smuggle in weapons and tools to help the anti-undead brigands and smuggle out any artifacts or treasure they could take from Geb. Her parents were drawn to each other through the passion of their cause, but there was little there to make it a lasting relationship. Her father, known to her by the name Zothel Theeraloh, left when Jhynn was very young. Jhynn’s mother married a human Garundi man and had three more children. They attempted to maintain a normal life in Yled (as normal as living humans can have in an undead metropolis) as a cover for the family’s illicit involvement with the Wagons of Light. Jhynn was naturally brilliant and inquisitive, her family sought to foster her skills for the good of the cause. She spent some time in Alkenstar working with her uncle to make potions, elixirs and other alchemical items for use against the undead. Her mother said that the magic inherent in her father’s lineage gave her special gifts with alchemy and the occult. Jhynn would accompany her family on some missions and some scavenging expeditions. She enjoyed tracking down artifacts and investigating ruins. On one such occasion she came across a lurid, forbidden text written by a now-forgotten Blood Lord of ages past. She studied the details within intently, learning much about extraplanar undead from beyond this reality. Thanks to her exposure to this book and the daily experience of growing up around the undead in the city Jhynn grew to see them as normal (albeit creepy as hell) people. She made friends with some dhampir children and intelligent zombie neighbors. Thanks to the Dead Laws, she felt less like a persecuted minority, and more of a curiosity among her undying neighbors. As she grew older she felt more and more upset about her family’s crusade against the largely peaceful people of Geb. Despite suffering occasional invasions by those who hated the undead, Geb hadn’t warred with its neighbors for hundreds of years. In fact it traded peacefully with Alkenstar, its old nemesis Nex, and other nations in the area. Jhynn felt they should just be left alone. Under pressure from her family, Jhynn continued to work on contraband holy items and chemicals for the cause. They never told her how they were being used, but she found out in 4683 AR. While in Alkenstar working with her uncle they received reports that a large positive energy bomb exploded in a crowded market in Yled. Many residents, both living and dead, were killed in the blast. Jhynn learned that even some of her friends had died. Her uncle confessed that they were behind the attack. Knowing the authorities would be after them, Jhynn’s family tried to flee but they were caught trying to leave the city. Her mother and step father were both executed for their crime and, as is the law in Geb, turned into obedient undead servants. No one knew what happened to her younger siblings, but they assumed the worst. Jhynn mourned for the loss of her mother, but was angry that she was duped into contributing to a terrorist attack. Not able to return to her home in Geb, and not able to even bury her mother she left behind her family in Alkenstar and went north. She spent some time in Nex, Katapesh and Osirion before heading across the inner sea. She made her way to Ustalav in 4688 AR. With many students called away to fight in the War Without Rivals, there were openings at the University of Lepidstadt for a foreigner with little formal education. It was there that she found a home. Finally she had a place to challenge and grow her mind. She dove into the subjects and developed a breadth of interests unmatched by her peers. Theology, history, philosophy, alchemy, mathematics, science, zoology and the arcane were all her strengths. She found herself most interested in the hard sciences though, using pure reason to deduce solutions to life's questions. But it wasn’t all academics for her, Jhynn joined the Malkenclaw fraternity and learned and perfected her swordsmanship as well. While not as strong as her classmates, she was quick and agile and with a trusty rapier she applied many a Lepidstadt scar. Just like in the classroom, when dueling she could usually out think and out maneuver her rivals. After finishing an advanced degree at the university and gaining recognition as valedictorian she was heavily recruited by the Sleepless Agency. She excelled with the organization. Solving cases, tracking criminals, finding missing people and uncovering information it was a perfect job to utilize her many interests and skills. 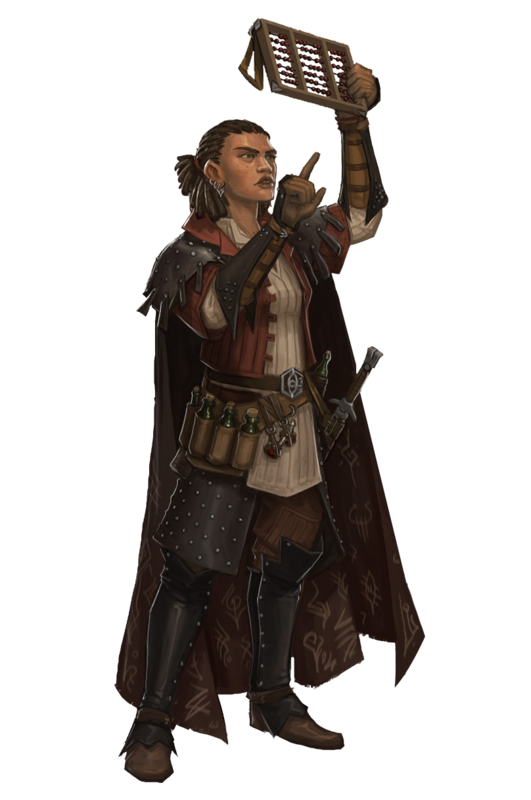 She rose through the ranks quickly and was able to distinguish herself after solving the mystery of the Key-Lock Killer after he killed nine people in Korvosa in 4697 AR. Her toughest challenge though was tracking down the notorious serial killer Dr. D. He had preyed upon Ustalav for decades and despite many of the Sleepless Agency’s best agents looking for him they were never able to get close. Finally, in 4700 AR after Dr. D struck again in the Canterwall capital, Tamrivena, the agency let Jhynn take a crack at it. She analyzed the many cryptic notes he left behind on his victims, plotted out his movements over time, and developed many theories about him and his crimes. Finally, after four years of coming up empty she caught a break. Dr. D slayed a couple in Courtaud by melting them together with fire and wax. The messy crime left enough clues behind for Jhynn to piece together to lead her to the man himself. Not wanting to tip him off, she went alone to a place she believed he frequented. Despite exercising great caution, she was only able to catch a glimpse of him before he realized her presence and fled. She chased but he was gone. To date this is the closest anyone in the agency has been to apprehending the legendary killer. She was assigned to the Varisia bureau and solved or investigated several incidents over the years to come. She brought Jervis Stoot to justice after he murdered 25 men, women and children in Sandpoint in 4702 AR. She investigated the 4705 AR explosion of the “Black Bronha” furnace at the Magnimar Golemworks. 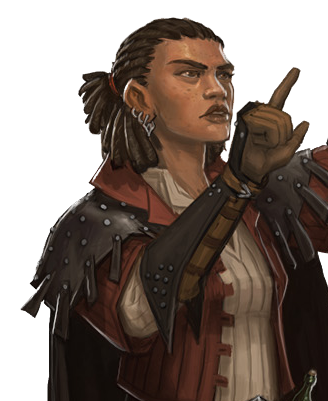 As she moved up the ranks she became a trusted source of information for Varisian leaders such as Lord-Mayor Grobaras and the several occupants of Korvosa’s Crimson Throne, as well as the many private entities operating in Riddleport, Kaer Maga and elsewhere. She was eventually made bureau chief overseeing agency operations in Varisia. While it took her away from the field more than she liked and it involved an insufferable amount of politicking, it did afford her the freedom to take on whichever cases she wished. Escorting the Lord-Mayor to a wedding, however, is not a case she would choose, but he requested her presence and her attendance was regrettably a political necessity. Jhynn has always been focused on her career and her investigations, and while she wants to continue to advance with the Sleepless Agency, she finds her thoughts are starting to turn to family. Both the potential of starting a family of her own, and of reconnecting with the family she left behind. She’s put them out of her mind for a long time, but she would like to track down her father, track down her siblings, reconnect with her uncle, and find her mother in order to finally put her to rest. Also, after coming so close to nabbing Dr. D, she would very much like to finish the job. Many other agents have tried and failed, and she would be a legend within the agency if she finally found him. Jhynn’s secret shame is the role she played in her family’s terrorist attack in Yled, that someone who has spent her career helping to uphold the law and track down criminals and threats to society was a part of a bombing of innocents. With the public hatred of the undead she doubts there would be any ramifications of having this fact known, but it still bothers her greatly. Plus the fact that she fled without ever tracking down her siblings, leaving them to who knows what fate. Akina Maresh - Her mother. Active with Wagons of Light and behind the attack in Yled. Captured and killed by Geb authorities, now somewhere in the nation as an undead laborer. Rubani Maresh - Her step-father. Never really accepted Jhynn or cared for her. Often sent her away to her uncle in Alkenstar. Killed and turned into an undead slave after the attack. Fantu Maresh - Her eldest half-sister, born in 4668 AR, she took after her father and despised Jhynn. Was committed to the anti-undead cause and had strong faith in Pharasma. Jhynn imagined she assisted with the bombing and was killed as well, though she never got confirmation of that. Zena Maresh - Half-sister, born in 4670 AR, never seemed terribly political. She shared her family’s prejudices against the undead, but seemed more interested in domestic crafts. If she survived, Jhynn always imagined she got out of Geb and started a family somewhere. Abebu Maresh - Half-brother, born in 4673 AR. He was Jhynn’s favorite sibling. Hot-headed, but kind, he was only 10 when Jhynn left so she’s not sure what path he would choose if he were still alive. Zothel Theeraloh - Her father, probably not his real name, she doesn’t know much about him. Just that he was tall with a fair complexion and blonde hair. Involved with the Voices of the Spire and came from somewhere in Avistan. It isn’t much to go on, but she’s found people with less. She’s just been too anxious about meeting her father to go looking. Her memories of him are few, but she remembers he was rather cold and distant. Dr. D - a serial killer with a passion for theatrics and puzzles, he will often leave cryptic letters addressing those he believes are following his trail of blood, challenging them to the intricate cat and mouse game that has engaged him for so many years. His killing spree has gone on for over 100 years, Jhynn would go down in history to be the one to finally nab him. Elram Osror - an eccentric tiefling professor at the University of Lepidstadt in Ustalav. A true genius, there are few subjects that he isn't an internationally renowned expert on, though he specializes in zoology (with concentrations in zoogeography, morphology & ethology). He has worked for decades to classify, catalogue and study the various creatures of Golarion (and beyond). He has written dozens of books, but his magnum opus is the 11 volume (so far) bestiary titled Historia Animalium. He has been a bit of a mentor for Jhynn, aiding her studies and following her career with the Agency. Whenever she finds herself stuck or needing some of his expertise she will contact him for his assistance. (this was actually a PC I created in another game that didn't pan out. Here is the character sheet.). Omari Yitaye - her mother’s brother who provided much of her early tutelage in alchemy from his workshop in Alkenstar. He was stern, but fair. He was more accepting of Jhynn than the rest of her family, but she still got the sense that he was mostly concerned with using her for the cause instead of having a real relationship with her. Addressed in the backstory. She doesn’t have any sentimental attachment to any of her equipment, they are just tools that help her do her job. Her rapier is the most valuable item she owns, so she values it highly based on that alone (more on it below). Her investigator’s hat she was given by her mentor, Professor Elram Osror. Mother being killed and turned undead. And the inadvertent role that Jhynn played in the bombing. Starting school at the University of Lepidstadt. After never being accepted by her family, never being accepted by the ghouls and vampires she grew up with, and never really finding her place in the world, at the university she finally found somewhere she fit. She excelled at everything she did and for once she was doing what she wanted to do, not what she was pressured into. Addressed in Step 1 and Step 4. She hasn’t been in contact with her family since the bombing. She never married, doesn’t have children. She is based in Korvosa, but travels frequently within Varisia. There may be some popular renown due to the high profile cases she solved, but she is more known among the leadership of cities, factions, noble houses and organizations within Varisia who may hire her for jobs. Oh my, so many options to play with for an 11th level character. But I've always wanted to play an investigator except the main combat feature doesn't start till 4th level and I've rarely ever played a game past 4th level so I haven't had a chance. Last edited by OzzyKP; Sep 21 '18 at 9:24pm. I've created a running tally of funds on the above sheet too. Last edited by OzzyKP; Sep 21 '18 at 3:56pm. Last edited by OzzyKP; Sep 6 '18 at 4:47pm. "Good morning to you, my friend," Jhynn greets her companions cheerfully, "Did you sleep well?" Should I tell them about the dream I had? I'm sure the goddess spoke to me directly, his thoughts are still excited as he pours himself some orange juice from the jugs left out by the landlord of their inn. Last edited by OzzyKP; Aug 5 '18 at 5:44pm. Making lots of progress. Sheet is mostly done, just need to buy more potions and odds 'n ends. Then just need step 5, 8 & 10, and then to list my equipment and I'll be ready for review. It looks pretty complete to me. You've got a very comprehensive back story that leads you to Magnimar and gives you reputation. I like how you've tied in some events from the different APs used by Paizo. Best of all there are lots of hooks for me to use. I didn't choose the life of a murderhobo, it chose me. Great! I like Golarian based games so I can delve into the world's history and link characters to the world. Still have to do the writing sample, mannerisms and continue tweaking my equipment & formula. But the formula stuff might depend on who ends up in the party so we're not duplicating roles. Last edited by OzzyKP; Aug 13 '18 at 1:48pm. Ok, I've finalized my formula. Sheesh, this character reminds me why I rarely play casters. Sooo many spells, sooo many options, ahhhhh. I've put everything in a Google sheet. Last edited by OzzyKP; Sep 6 '18 at 8:41pm.